Sir Ringo Starr. Sir Richard Starkey. Either way, it has a lovely (Dare I say it?) ring to it! And there’s an appendage that seems to be attached to the title, whenever a Beatles fan utters it. It goes like this, “Sir Richard Starkey, About Damn Time.” Right? Ringo was the first Beatle I knew about as I grew up in the Dingle near Madryn Street where he was born, and I attended the same primary school, St. Silas that he had. The Dingle was a tough place to live back in the 40s and 50s. He had such a hard childhood, with his father leaving home when Richy was only 3. He then nearly died from illness at the age of 7, missed a lot of school, contracted tuberculosis at 13 and was so ill. And yet, he emerged from this backdrop of adversity to become one of the most respected drummers of all time, and not just because he was a Beatle! Having studied his drumming for my new book Finding the Fourth Beatle, I can now truly appreciate what he contributed to The Beatles and their sound. Don’t let anyone tell you he was lucky. He wasn’t! Finally he is getting the recognition he deserves. Arise, Sir Richy of Dingle. My favorite Ringo moment was being at his 70th birthday at Radio City when Paul showed up and the two of them played “Birthday” together! After Ringo’s set was over, I noticed a stagehand run out and place Paul’s iconic bass in the middle of the stage. I turned to the person I was with and let them know what was about to happen, even though I couldn’t quite believe it. Within seconds, Paul ran out, the place went ballistic (it was literally shaking), Ringo came back out and ran to his kit, and the song started, with Paul belting it out as if it was 1968. It was an unreal experience. For someone my age (I was born in 1983), seeing two Beatles playing together live was something I didn’t think I’d ever witness. My most precious memory of Ringo was during their 1964 Press Conference in Chicago. I was 16 years old then and our Beatles Fan Club was in attendance to present a plaque to the Beatles. When they entered the room, the press ran to take photos and ask questions. By the time we reached that side of the room, the Beatles were already talking to reporters. Peering over heads, I caught a glimpse of George, John and Paul, but didn’t see Ringo. I asked my friend where the heck was Ringo. The fellow standing directly in front of me turned and said, “Here I am darling” and gave me a hug. I almost fainted…It was Ringo! Thank you for the wonderful Ringo moment. Big hugs to you, Ringo, fifty-four years later. As a Second Generation Beatles fan, I grew up with a Ringo loving mom. My mom, Coral, has loved Ringo Starr from the moment she first saw him on the Ed Sullivan Show in 1964. Throughout my life, I have always heard the praises of Ringo. (How he is the best drummer, sings the songs so much better than the cover versions of them, he is the funniest, the nicest, and the cutest.) And while I am a John girl myself, I have always had a soft spot for Ringo because my mom has always loved him. My favorite Ringo memory was when my mom and I saw Ringo in concert in 2014. We had great seats, 4th row center. At the last Fest that we had attended, my mom had bought a T-shirt from Mark Hudson that said, “Ringo Rocks!” In the middle of singing “Yellow Submarine,” Ringo noticed my mom’s shirt and made a motion across his chest to signal that he had read the shirt and then gave a “thumbs up.” My mom was thrilled beyond belief! Ringo actually noticed her 50 years after she first noticed him! I think it is great how Ringo goes out of his way at his concerts to wave or give a peace sign to as many fans in the audience that he can. 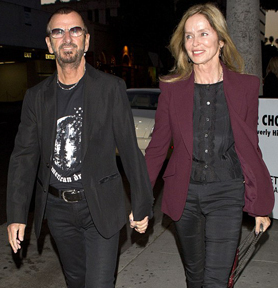 As my mom’s shirt said – Ringo Rocks! At The Beatles After Party, I was chatting with Jim Keltner and John Densmore (drummer for The Doors). Ringo came up to say hello (to the drummers, not me. LOL) He said something like, “Oh, I didn’t know we were having a drummers’ convention.” I said to Jim Keltner, “I must have died and gone to drummer’s heaven!” Keltner is a fan too, so he understands. It was just a nice, relaxed chat. I just got to hang, say hello, and mostly listen to these amazing musicians. Needless to say we all talked about how much we loved the show. Generally, my favorite thing about Ringo is the nearly 30-year running All Starr Band franchise. Got to see so many musicians I might not have ever gotten out to catch in concert. 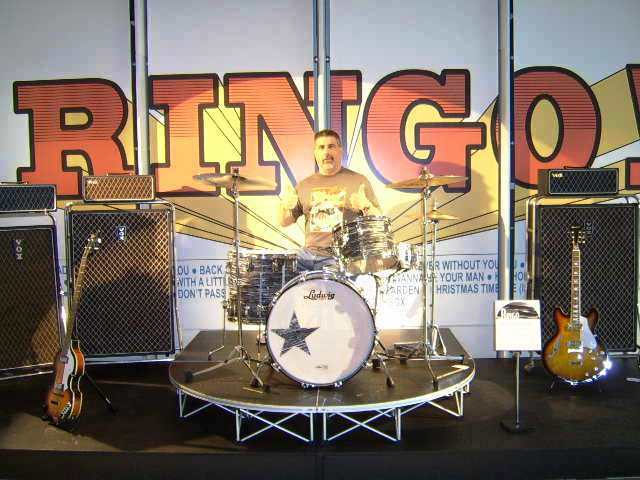 Seeing Ringo play so many styles of music and jam with the likes of Joe Walsh, Dave Edmunds, Felix Cavaliere, Billy Preston, Peter Frampton, and so many more has made for so many great memories! 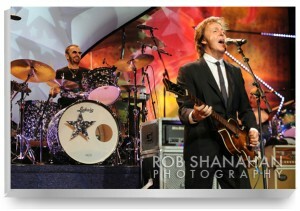 BEST MOMENT – 7/7/2010 – All Starr’s do a concert on Ringo’s 70th birthday and Paul shows up to play – what else – “Birthday”! Place went crazy – TOTAL BEATLEMANIA!!!! Ringo’s showmanship as a solo artist has grown more and more electric. I remember the Grammy Awards Salute to the Beatles TV special—when he bounded onstage to perform his solo spot, he OWNED that room. Wearing a radiant smile, Ringo ran up and down the stage, leading the ecstatic audience in singalongs and infusing the room with joy. Seeing an over 75-year old enthrall an audience of all ages? THAT’S an inspiration. My favorite memory involves George Martin, who always felt bad about the way Ringo was welcomed into EMI Studios in the wake of Pete Best’s ouster and the manifestation of studio drummer Andy White. Years later, George would note that Ringo never complained in the studio, working for hours on end behind his kit as the others worked out their ideas, only making a small handful of errors in all of that time. It’s an astounding record, really, and a great tribute to Ringo’s sense of his craft. 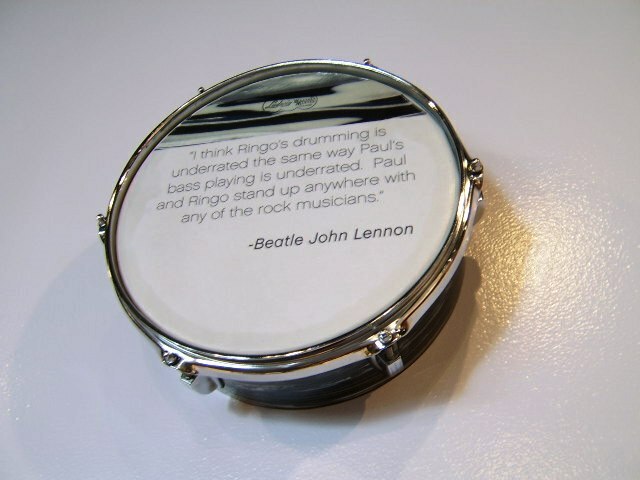 One of my favorite Ringo quotes/comments is taken from an interview years ago: “First and foremost I am a drummer. 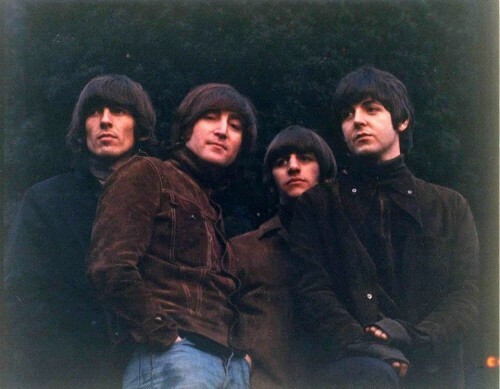 After that I am other things.” In his self-effacing way, Ringo reveals what he hopes will be his legacy unaware at the time perhaps of the huge impact and imprint he and his band mates had left on the world. Everlasting indeed! A perfect example of this was witnessed the first time I saw Ringo live with his first All-Starr Band in 1989. Elated to see a Beatle in concert for the very first time (my 2nd being Paul in July 1990), I was struck at how he was simply just a part of the band. (Front and center when needed, but happy to be nicely tucked behind his kit as he transferred the spotlight to the other band members as they sang and soloed through their hits.) I have seen several incarnations of the All-Starrs through the years, and it is always an evening to sit back and enjoy an evening of Peace, Love, great music, and incredible moments. 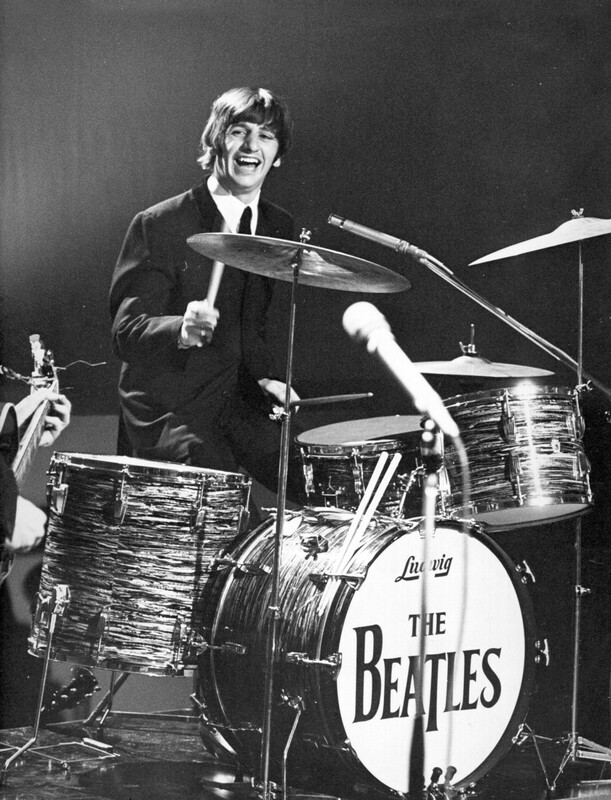 Sir Richard Starkey: a great drummer and humanitarian…and always unforgettable! It’s 1967 in the pine paneled, shag carpeted rec room of my grandmother’s house in the south end of Seattle. She had let me stay up late because the midnight matinee on channel 4 was A Hard Day’s Night and she knows how much I love The Beatles. So, I’m camped a couple inches from that glorious 20″ black and white cathode ray tube, and there’s Ringo, making me laugh while he rocks my cowpoke pj’s off – with his hideous great hooter, and his poor little head, trembling under the weight of it! To this day, he still rocks me and he makes me laugh. I think socially/emotionally, Ringo made out the best of the four. Being an only child and spending many years “in hospital” as a youngster, I think he found a band of brothers in the other three – an instant family. As he missed much schooling in his formative years because of his health, he was not extremely “book smart,” and I think he could come off as a bit unfriendly to outsiders and let the others do the talking a lot. With the Beatles, however, he knew he was never judged and wasn’t made to feel that he didn’t measure up. He could just be himself and not think before he spoke. He was with family. Ringo, you are still with family, but these days, the family is quite large: worldwide. From Michael Quinn in Italy to Gabor Peterdi in Hungary to Adam Forrest in California, we love you and are so very proud. We read Dave Bedford’s words and tear up because we, too, feel a part of who you are and what you’ve done. And over the past fifty or so years, we’ve all been immensely honored to take the journey with you. Peace and Love – may they be yours, Sir Ringo. 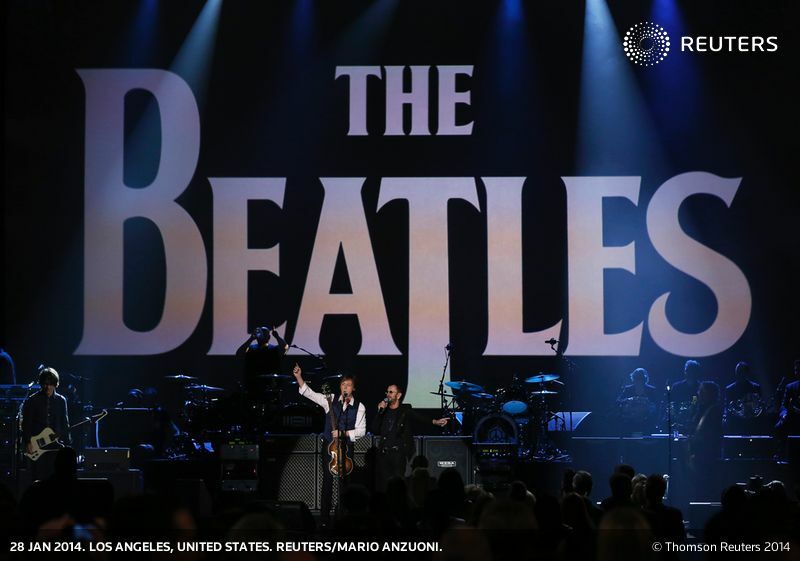 To recognize the 50th anniversary of the arrival of The Beatles in America, the Grammys made last night’s ceremony a Beatles-centric one, and Paul McCartney and Ringo Starr were the rightful centers of attention. The two legends were on hand to receive a Lifetime Achievement Award, were seated next to one another in the front row, and both took the stage. Aside from Paul and Ringo, Yoko Ono, Sean Lennon, and Olivia Harrison were also in attendance. Yoko and Olivia presented an award with Alicia Keys near the end of the ceremony. 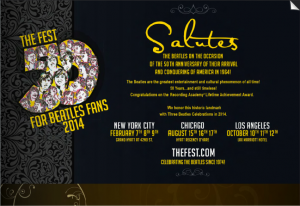 The FEST took out a half page ad in last night’s Grammy program book saluting The Beatles. 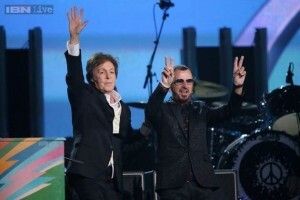 It was Paul (the winner of five awards last night) and Ringo, though, who were the highlights of the evening. First, Ringo took to the stage to sing his 1973 hit “Photograph.” Starr and George Harrison co-wrote “Photograph” in 1971, and the pictures of the Fab Four flashing behind Ringo as he performed made for a poignant, moving moment. The crowd rose in unison as Ringo performed, and it was a truly special scene. A bit later on, Paul McCartney took to the stage to play “Queenie Eye” from his new album. With Paul playing a piano from the Magical Mystery Tour era, Ringo joined in on drums, creating the surreal and amazing site of the two living Beatles performing together. The last time the two performed together was in 2010, when Paul surprised Ringo on the occasion of his 70th birthday at Radio City Hall and the two performed “Birthday” together. Incredibly, last night’s scene may simply serve as an appetizer for Beatles fans who are hungry for more. Tonight, CBS is recording a special titled “The Night That Changed America,” a two hour salute to The Beatles that will air on February 9th at 8PM. It was amazing to see Paul and Ringo together last night, and the February 9th special airing on CBS should provide us with more memories that will be long lasting. Ringo and Paul perform at Radio City in 2010. Photo by Rob Shanahan. Ever since it was reported that both Paul McCartney and Ringo Starr will be in attendance at this year’s Grammy awards – and that there would be a special Beatles tribute the night after the Grammy’s, rumors have been swirling that the two would perform together. To celebrate the 50 years since we landed in New York in February , they are putting on a big show on Monday and we will be doing it there. It’s unknown at this point exactly what Paul and Ringo’s performance will entail, but let’s hope it involves Paul at the microphone and Ringo behind his kit – at least for part of the performance. Paul and Ringo have played together a handful of times since The Beatles broke up in 1970. The most rollicking one occurred in in July of 2010, when Paul surprised Ringo for his 70th birthday at Radio City. The crowd went insane, Ringo got on the drums, and Paul belted out “Birthday” with Ringo playing behind him. Ringo’s photographer Rob Shanahan, who captured the above image of Ringo and Paul at Radio City, will have that photo and other memorable Paul and Ringo photographs, gallery prints and lithographs available for sale in his gallery at this year’s NYC Fest. Check out Rob’s site here. On the seventh day of the seventh month we celebrate the birthday of the greatest rock and roll drummer of all time. 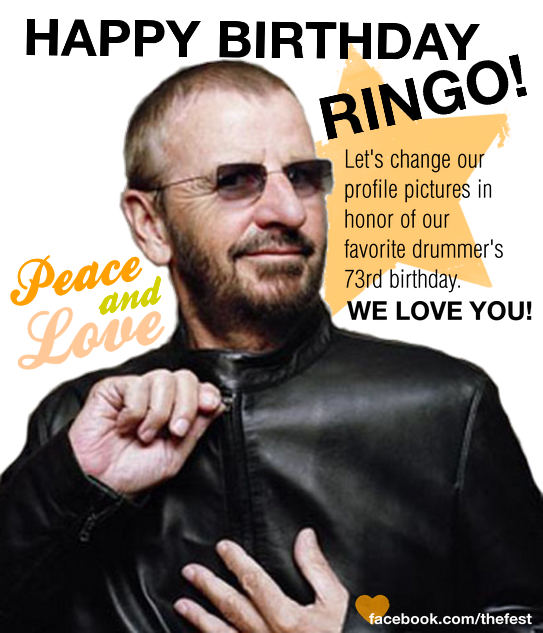 In what is now a Ringo Birthday tradition, wherever you are at 12 Noon today, hold up a peace signal and say Peace and Love, Peace and Love, Peace and Love. HE’S THE GREATEST – AND YOU BETTER BELIEVE IT BABY ! In a Beatle-filled summer dominated by Paul McCartney’s “Out There” tour and series of Wings era reissues, Ringo Starr is making headlines of his own. For starters, he’s bringing his 12th All Starr Band out for an unprecedented 3rd leg of a tour that began in the States last summer and hit the road again at the start of the new year, traveling to Japan and the Pacific rim. In the fall, the current band heads to South America before returning to the States for a two night stand in Las Vegas to wrap things up. But the big news this summer is the Ringo Starr: Peace & Love celebration now on exhibit at the Grammy Museum in Los Angeles. 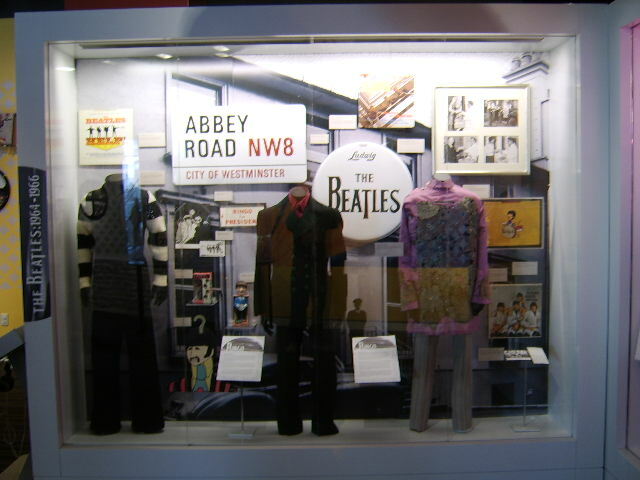 Not unlike New York’s Rock and Roll Hall of Fame Annex exhibit dedicated to John Lennon a few years ago, it is a treasure trove of mostly unseen artifacts, media, and interactive exhibits that any Beatles or Ringo fan (count me in for both) will absolutely delight in. 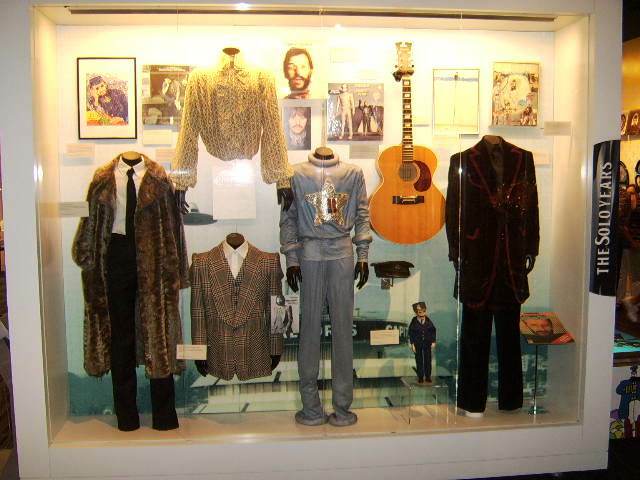 That such a collection was able to be culled together at all is noteworthy, as much of the memorabilia Ringo had kept was destroyed in a 1979 fire at his home. Gathered from storage facilities his handlers managed, and even a few boxes of early mementos Ringo took possession of when his mother died in 1986, the exhibit covers the earliest Liverpool days, through each phase of the Beatles story, his careers as both a solo performer and with the All Starr Band (can they really be approaching their 25h anniversary next year?). Upon landing in LA, I was struck by the street lamp banners lining every major street in the metropolitan area, including Hollywood Boulevard near the Capitol Records tower at Vine Street, where all four Beatles’ stars now reside on the walk of fame. 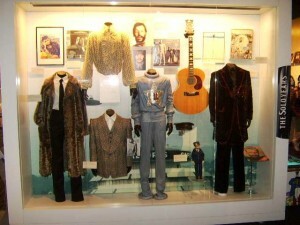 While the Grammy Museum is home to numerous temporary and permanent exhibits, it was clear from the moment of entry that they rolled out the carpet for Ringo. In the lobby was a replica Beatles stage set up, with Ludwig drums, an Epiphone guitar and a (gulp! Right handed) Hofner bass which fans are encouraged to use for photo ops. On that note, while the tickets state “no photography”, no such restriction was even remotely enforced on the exhibit floors. An elevator deposited fans near the Clive Davis theater where a continuous 17-minute loop of video highlights is offered, containing some rarely seen concert and movie footage, as well as snippets of various promo films. (An exit escalator was itself a treat, as a hand painted Beatles/Ringo mural adorned the incline). Drumheads, posters, handbills, and a host of rare memorabilia flesh out each case. It must be pointed out that any “replica” items are fully designated as such, such as the “antenna” logo drumhead from the early Cavern Club days. 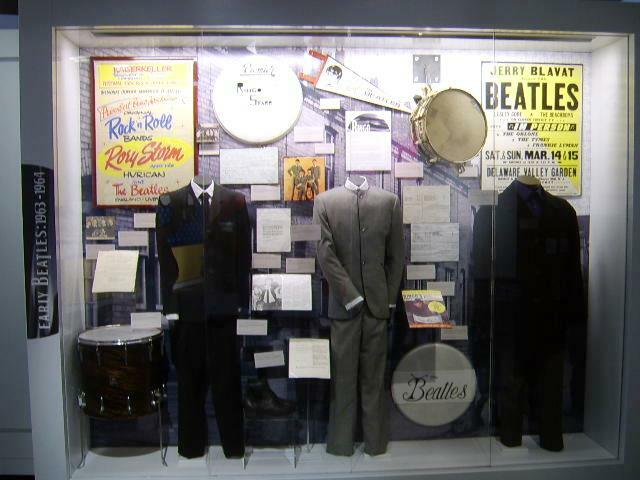 Speaking of drums, three iconic kits are on display (under glass): the Shea/Ed Sullivan kit (with replica drumhead), the later years set as seen in the Let It Be movie and rooftop concert, and a latter day All Starr Band set. Beyond the movies and music memorabilia, there are sections dedicated to Ringo’s artwork and photography, including his new e-book Photograph, which proved spectacular. I’m old school and prefer my books on paper, thank you very much, but the interactive capacity such as Ringo’s own narration describing some of the shots, was a real treat. On the topic of things interactive, there is a sing-along booth (amounting to a karaoke version of “Yellow Submarine”, complete with lyrics monitor. First, Ringo is heard on the original Beatles track, then the vocals go away and you take a stab at it. During playback, the on-screen offerings include “play it again” and “make it stop!”. You say drumming is your madness? 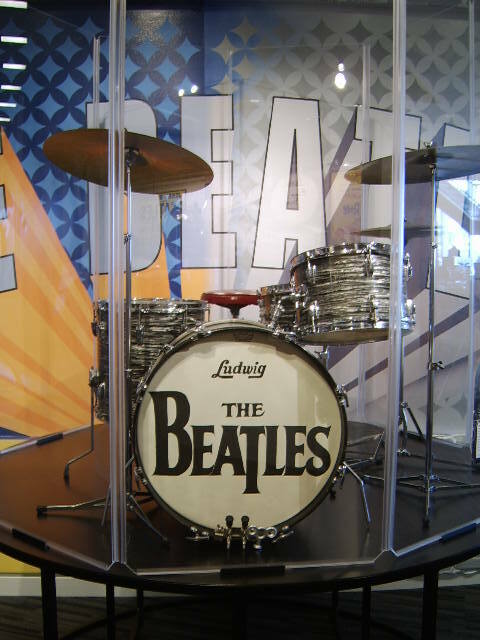 Two kits are on display, where fans are encouraged to take a virtual lesson with Ringo, via a computer screen mounted atop the bass drum. My musical DNA is of the six-string variety, but I have to admit it was a total blast! More of a behind the scenes type? Try your hand at remixing a live version of “With A Little Help From My Friends” at the mini studio. 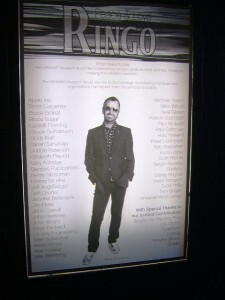 Elsewhere, a video station with a menu of on-demand career clips is available, as are several listening stations featuring Ringo’s biggest hits. A testimonial video with artists such as Jeff Lynne and Max Weinberg discussing Ringo’s musical legacy is offered as well. Select quotes from key figures in Ringo’s life adorn snare drum heads, tastefully sprinkled throughout the exhibit area. My favorite comes from George Harrison: “Playing without Ringo is like driving a car on three wheels”. Similar testimonials from John Lennon, Paul McCartney, George Martin, Jim Keltner, Max Weinberg, DJ Fontana and others round out the set. Fans should allow 90 minutes to two hours to fully experience the exhibit (and more to see the other museum fare). The only disappointment I found was, of all places, in the gift shop. The only disappointment I found was, of all places, in the gift shop. Discounting a couple of mounted hand-signed drumheads put together by Ringo’s longtime associate, and FEST regular Neal Glaser of Celebrity Art (asking price: $1200 each, with 100% of the proceeds going to Ringo’s charity, the Lotus Foundation), there wasn’t a single item offered that was unique to the exhibit and mentioned it by name. There were Peace & Love t-shirts and other Ringo garb typical of the merch offered at his concerts, and a selection of Ringo and Beatles CD’s and DVD’s. But if you wanted something with his name and the museum, and didn’t have the aforementioned $1200, you had to settle for a glossy two-sided announcement card, available in the lobby and various music outlets around town. Fans living in or visiting the in the LA area are encouraged to do whatever it takes to navigate the mind-numbing traffic (ya know it don’t come easy) to experience this Sentimental Journey celebrating your friend and mine, Ringo Starr. 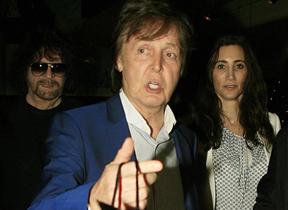 Saturday, April 20th, Paul and Nancy McCartney met up with Ringo and Barbara Starr for dinner at Mr. Chow in Beverly Hills. The couples look fabulous as usual and were also joined by Joe Walsh and his wife (Barbara’s sister) and Jeff Lynne. We hope the fans and media gave them the privacy they deserve. With Paul about to start another tour this year and Ringo just completed tour of the Far East and considering another leg of the tour, perhaps in South America, they should have much to talk about. Whatever they discussed, it is always wonderful to know that they get together, as brothers would normally do. Peace and Love.